“Life of a Continental Soldier” will be the topic of the program at this meeting of the Henry Downs Chapter of the Daughters of the American Revolution. Baylor history professor Dr. Julie Sweet will present the talk in the community room of the Community Bank Wealth Management Building, 1711 Lake Success Drive. Refreshments are served at 1 p.m., and the program will begin at 1:30. Opening reception from 6 to 10 p.m. for Professional Artists of Central Texas small works show and sale at Cultivate 7twelve, 712 Austin Ave. The show and sale runs through Feb. 14. Lisa Burkhart Worley of Pearls of Promise Ministries will present “The Write Mix.” The 6 to 7:30 p.m. event is free and is held at First Baptist Woodway, 101 Ritchie Road. Call 339-3060. Skip Hollandsworth, executive editor of Texas Monthly, will review his best-selling book, “The Midnight Assassin,” about a serial killer in 1800s Austin at 10 a.m. to kick off the Director’s Forum at the Mayborn Museum. An “Investigating Forensic Science” panel discussion is at 11 a.m. Demonstrations run from 1 to 2:30 p.m. Admission included with general admission to museum. Call 254- 710-1110. Online: baylor.edu/mayborn. The family-style musical jamboree will have its Ralph Sparks Gospel Edition show, 7 p.m. at Lee Lockwood Library and Museum, 2810 W. Waco Drive. Cost is $14 for general admission, $12 for those 65 and older. Advance tickets at Lone Star Music and Lee Lockwood Library and Museum. Call 755-7257. Also on Facebook. 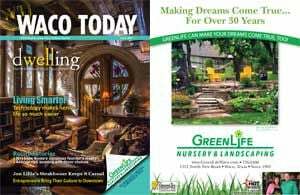 The annual Home Products Show will be in the Extraco Events Center, 4601 Bosque Blvd., 10 a.m. to 5 p.m. Saturday and 11 a.m. to 5 p.m. Sunday. Admission costs $5. Chris Fabiszewski will speak on editing at the weekly Wednesday night meeting , 6 to 7:30 p.m. at First Baptist Woodway, 101 Ritchie Road. Call 339-3060. McLennan Community College Foundation and MCC hosts “An Evening with Winston Churchill Biographer Andrew Roberts” at 7:30 p.m. in the Conference Center on campus. Admission is free, but tickets are required and available through Eventbrite. Email lelliott@mclennan.edu or call 254-299-8640. Backroads will perform, 7 to 10 p.m. at Tours Hall, 245 St. Martin’s Church Road in Tours. Those attending should bring finger foods. Admission costs $5. Texas Fine Artists reception, 1:30 to 3 p.m. at the Carleen Bright Arboretum, 9001 Bosque Blvd. in Woodway. Exhibit is up from Feb. 5 through March 3. Members will share a 250-300 word testimony or story from their childhood, 6 to 7:30 p.m. at First Baptist Woodway, 101 Ritchie Road. Call 339-3060. Local Author Mary L. Hamilton will speak on “Taking the Fear Out of Marketing” at the weekly Wednesday night meeting, 6 to 7:30 p.m. at First Baptist Woodway, 101 Ritchie Road. Call 339-3060. Branded Heart will perform, 7 to 10 p.m. at Tours Hall, 245 St. Martin’s Church Road in Tours. Those attending should bring finger foods. Admission costs $5. Members should be prepared to share a 250-500 word testimony about a “Crossroads Event in My Life” at the weekly Wednesday night meeting, 6 to 7:30 p.m. at First Baptist Woodway, 101 Ritchie Road. Call 339-3060. Dallas historian and author Rosemary Rumbley will be the featured speaker at the weekly Wednesday night meeting, 6 to 7:30 p.m. at First Baptist Woodway, 101 Ritchie Road. Her topic is “God Will Always Bless His Writers.” Call 339-3060. The 2019 class will be honored 6 p.m. at the Waco Convention Center. A reception will be at the Texas Sports Hall of Fame beforehand at 4 p.m. Combination reception/banquet tickets cost $200 each or $1,400 for a reserved table of eight. Banquet-only tickets cost $75 each, or $600 for a reserved table of eight. Call 800-567-9561 or visit http://www.tshof.org/buy-tickets/. Items ideally should be emailed to ksury@wacotrib.com by the first day of the month prior to the month the event is held. Deadline for events for the March issue is Feb. 6.